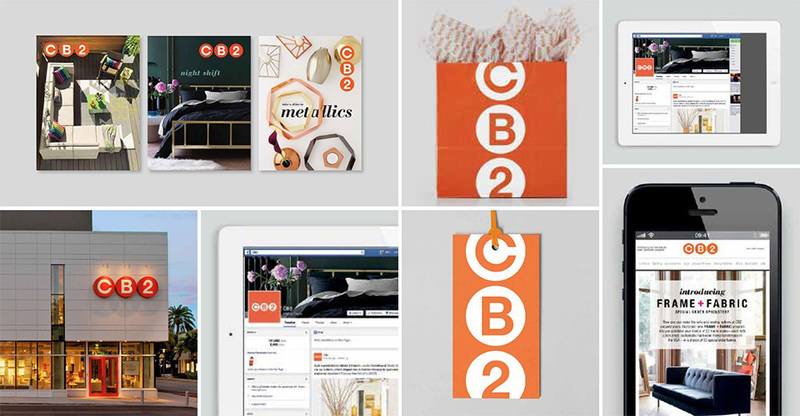 Established in 2000, CB2 is a modern furnishings store for the apartment, loft, and home, created as an off-shoot of (and by) Crate & Barrel. Where C&B sells more straightforward, streamlined, and basic home furnishings, CB2 is slightly more eclectic and eccentric. Originally a single store in Chicago, CB2 now has 14 stores across major U.S. cities as well as in Toronto, Vancouver, and Singapore. Although the new logo has been visible on their website since March of last year, CB2 officially introduced it last Friday and has been designed by New York, NY-based Mother. Logo exploration. (I really hope they didn’t give that many options to the client). We determined that a whole new look would be too risky and may alienate some customers. We also felt that we should keep some aspect of orange in our logo since it’s become such an integral part of our brand. So with our favorite selection in mind, Mother removed the orange background circles, streamlined the “C,” “B” and “2,” and placed them inside a thin orange box. From old to new logo. The old logo wasn’t great or highly imaginative but it had a clear(er) relationship to its parent brand, by using the “C” and “B” from the Crate & Barrel logo. Placed inside circles, the letters made for a fairly recognizable mark — I remember it being very visible from inside the L train’s red line in Chicago when I lived there. The new logo seems to want to establish some distance from Crate & Barrel and perhaps signal more clearly that you won’t find the same things in the two stores and that CB2 has its own identity (in terms of identity and inventory) separate from its more conservative and larger retail parent company. The new logo is not great either and is much more forgettable than the previous one, blending in with a dozen other sans serif wordmarks inside thin-stroked boxes found across the retail world, be it fashion or food establishments. There is nothing wrong with the logo technically, it’s fine but it’s not telling anyone anything about the store. The limited range of prototype applications don’t provide any further evidence that there is more to this identity than meets the eye. Perhaps with time there will be more but for now, might as well just head to Crate & Barrel. P.S. Happy new year to all!